A Selby businesswoman who helped to transform a barrow and an honesty box into a thriving farm shop and events business has been honoured at the Deliciouslyorkshire Taste Awards. Along with her husband, Jason, Charlotte Wells Thompson has built up Bert’s Barrow from old barrow that was dressed with local produce to an enterprise that now incorporates a farm shop, a wedding and events venue and a vegetable box scheme. 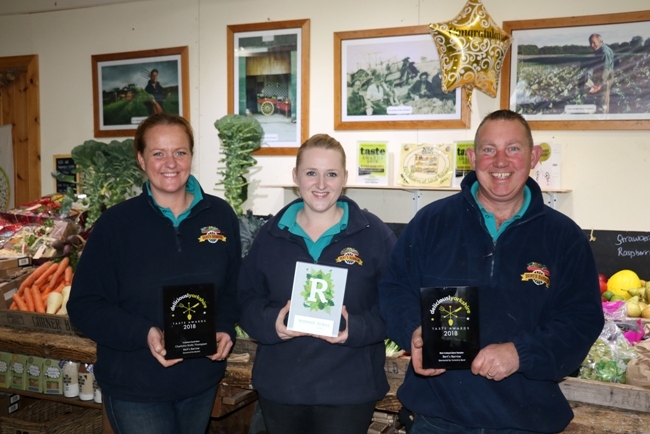 In addition to being awarded the Local Food Hero accolade that recognises someone who has done an exceptional job promoting local food and drink, the four year old Hillam business was also awarded Best Independent Retailer at the same awards ceremony at Harrogate’s Pavilions. Charlotte said: “As a retailer, it’s our job to show our customers what wonderful food is available right here in Yorkshire. Every producer is passionate in their own right and they all have their own story to tell and it’s our job to tell it in their absence. “We are proud to stock over 400 Yorkshire made products, with 22 producers from within a 10 mile radius, as well as growing some seasonal vegetables ourselves. Whether it’s smoked, baked, grown or made in Yorkshire, we will try our best to stock it. The judges commented: “Growing the business, along with her husband Jason, from its humble beginnings into a successful enterprise, the team now offer seasonal pick-your-own events and an expanding events venue. The Deliciouslyorkshire Taste awards champion the best of Yorkshire’s food and drink producers and retailers and are judged by a panel including chefs, retail industry experts, food writers and BBC Radio personality Nigel Barden. Success in the Deliciouslyorkshire Taste Awards is the culmination of an exceptional year for the family business that also won Highly Commended in the Yorkshire Post Rural Awards and Welcome to Yorkshire’s White Rose Awards and whose employee Charlotte de Ville won the Employee of the Year at the North Regional Rural Business Awards ceremony in recognition of her consistently positive attitude and exemplary work ethic. This success earned her a place in the national final that takes place in Worcestershire on February 28, 2019. Bert’s Barrow was established in 1999 as a way to raise vital funds for a defibrillator for the village of Hillam, near Selby. The brainchild of villagers Ian (Bert) Thompson and his wife Marlene, it started life as an old barrow that was dressed with local produce and left it at the front of the family farm with an honesty box. Ian’s son, Jason and wife, Charlotte took over the barrow in 2014 after Bert passed away and extended into a barn to create a farm shop that champions a wide range of Yorkshire produce and has subsequently developed another barn as an affordable wedding and events venue.